Titanfall is a team based first person shooter focused on mobility and improvisation instead of tactics and stealth. The first thing you’ll go through is a training phase which will acquaint you with the mechanics, which range from the standard movement and aiming to wall running and special abilities of your Titan. I love the Titan’s vortex shield that catches incoming projectiles before launching them back. It’s particularly entertaining when you fire a barrage at another titan, have them catch it and send it back, only to successfully return the favor with your own vortex shield. Perks (like those in the Call of Duty series) unlock as you level, and there is one that allows for ‘rodeoing’ a Titan by latching onto its back and shooting it up close. When you’re being ridden, your usual recourse is to eject from your Titan and shoot them off, or your teammates can bail you out. I had one great shot where a pilot (the term for human players, rather than the AI grunts that also populate the maps) was flying towards my screen to rodeo me and I picked him clean out of the air. I’ve had more “wow” moments in Titanfall’s short beta so far than I’ve had in any other multiplayer shooter in years. The most unique weapon in Titanfall is the smart pistol, which locks on to targets after hovering the aiming reticule over them for a short time, allowing you to then dish out automatic headshots. You have to lock on three times to kill a human player but only one lock is needed to take down an AI grunt, making the smart pistol a very efficient weapon in the hands of a skilled player. 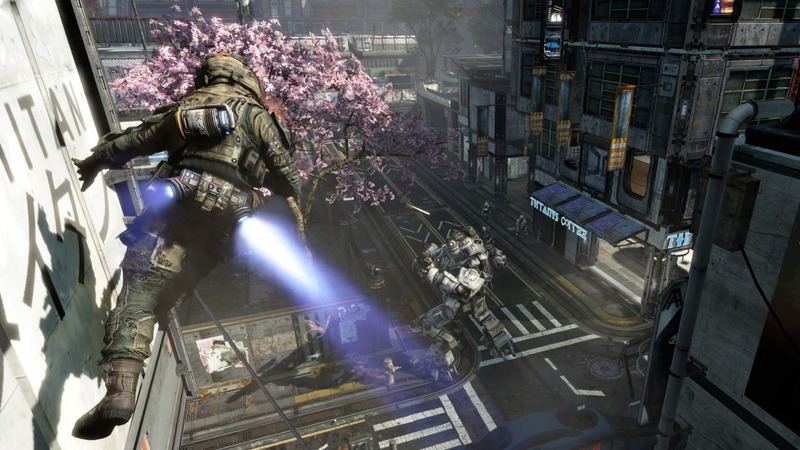 Titanfall is due out on PC and Xbox One on March 11th.